This DIY tutorial turns a cast off window and an engineering print sized family picture into a repurposed, rustic old window photo frame. 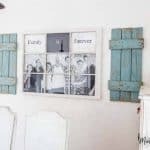 As a true Pinterest fanatic I pinned a window family frame from Domestically Speaking and hoped to incorporate the idea somewhere in our rustic DIY home. 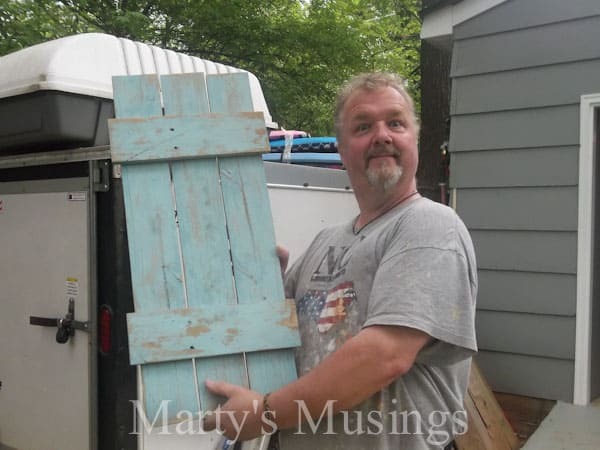 As my decorating style has evolved my hubby and I love to repurpose things we find on the side of the road or at yard sales into thrifty new home decor! 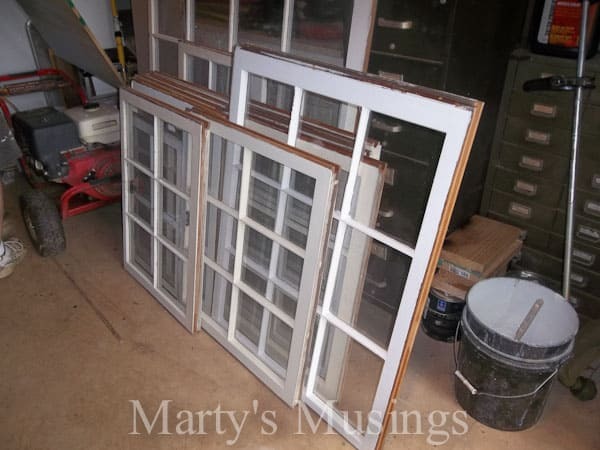 When Tim came home with all these free windows recently I knew I could turn one into a fabulous (and cheap!) accent wall in our kitchen. Step 1. 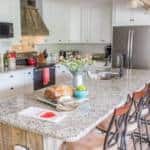 Decide on photo, edit as needed and print. 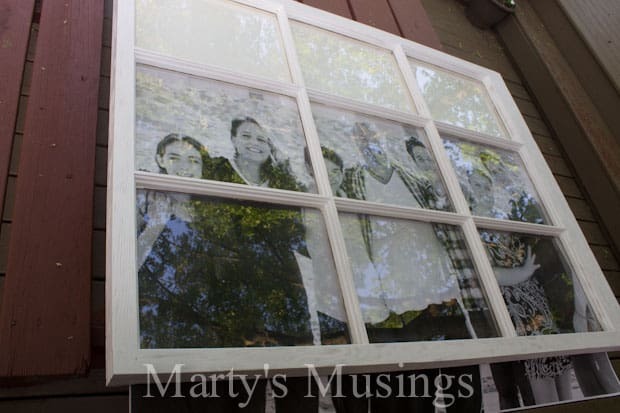 The first step is deciding on which photo to use, how to have it printed inexpensively and then making it fit in whatever sized window you use. Believe it or not, the first picture I picked worked fine as a 24×36 engineering print. I ordered the print from Staples (cost $3.50). Online ordering says photos shouldn’t be printed as an engineering print but I did it anyway. I figured for less than $4 it was worth a try. The first time I didn’t lighten the photo sufficiently in lightroom, but I could tell that the photo would work size wise in the window frame. With seven people in the photo I was trying not to cut someone’s head off! You know how siblings are……I didn’t want any hurt feelings! I edited the photo, printed a second time and it worked perfectly. My husband took the window and scratched up the surface with a grinding bit. He then used a heat gun to further distress the surface. At this point the whites of the window didn’t match the white in our kitchen so Tim went back and repainted it with white aerosol primer and distressed it one more time. Second printing of the picture was perfect and the frame looks great. 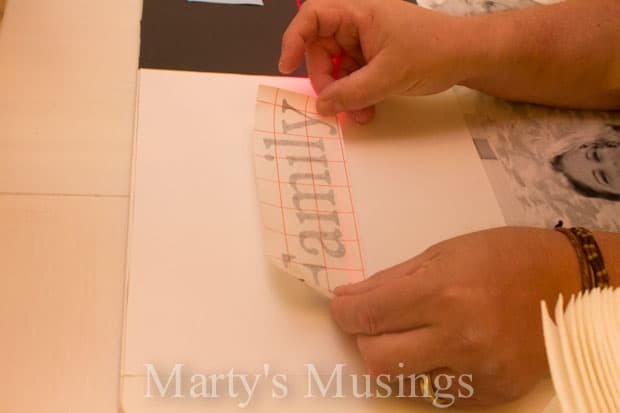 Using a rechargeable ZipSnip cutting tool (one of our favorite tools ever!) my husband cut the foam board to fit the frame. 4. 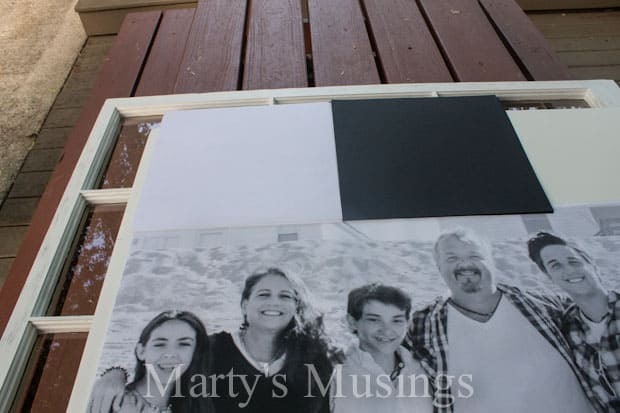 Add black and white cardstock to window panes. Since the print didn’t fit perfectly inside the window I had to think outside the box! I used the print for the lower two-thirds and then added black and white cardstock to the top three window panes. 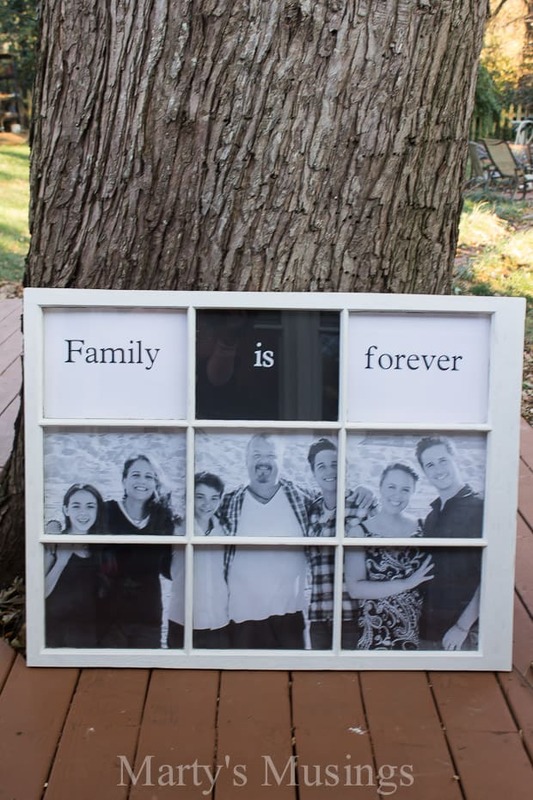 I then used my trusty Cricut and printed the words “Family is forever” on black and white vinyl, adding the saying to the cardstock. 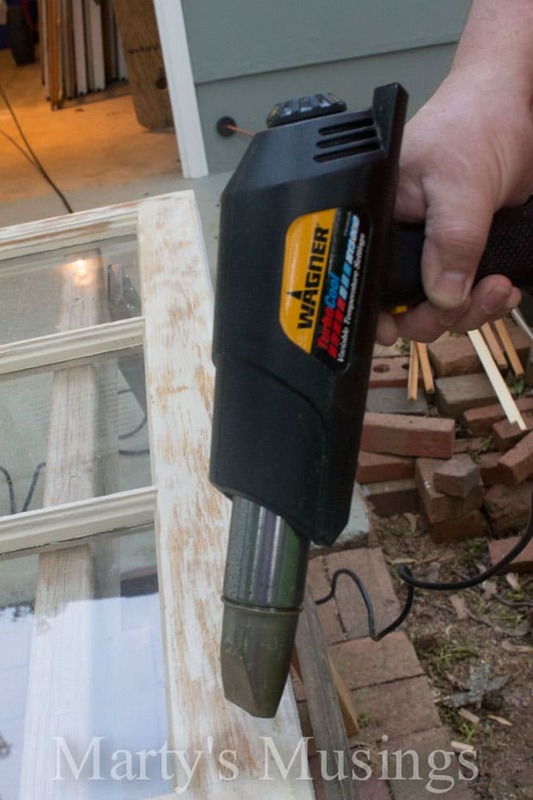 Once everything was secured to the foam board it was then attached to the window itself with brad nails and a staple gun. 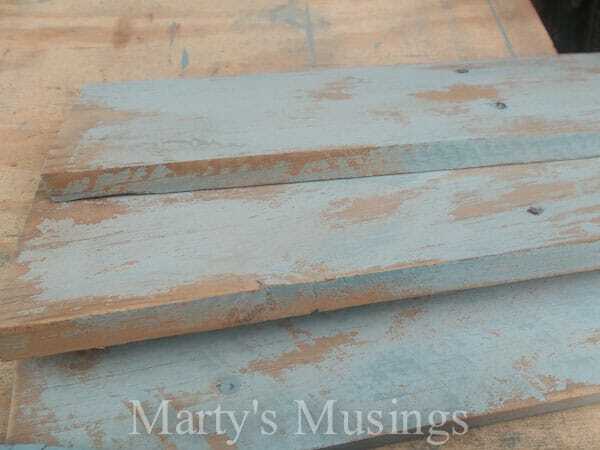 The boards were then sanded again with a palm sander, heavily distressing the boards. 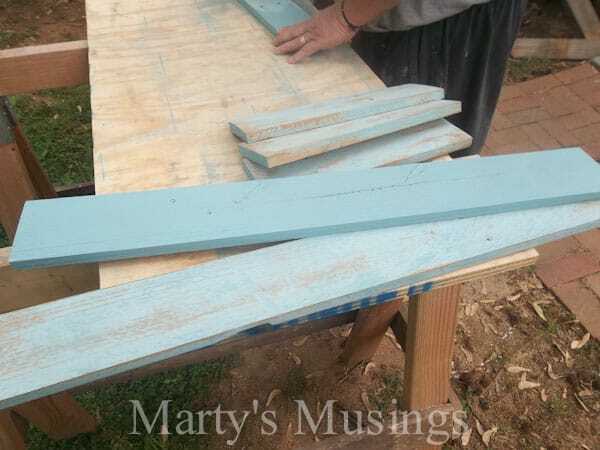 The wood was nailed together with finish nails and was then ready to hang in our kitchen. My husband should definitely be proud of his ingenuity! 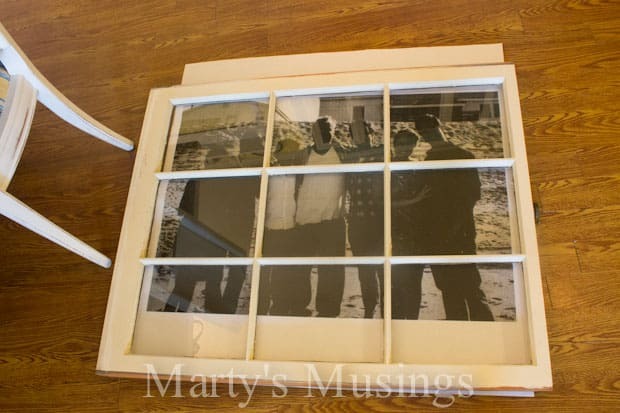 Here’s our completed old window photo frame. I couldn’t be more pleased with the way this turned out. 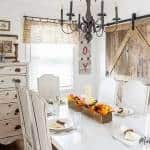 It takes up an entire wall in the kitchen and is the perfect addition to our makeover. 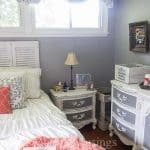 Ever since my husband made a fabulous coffee table out of an old window we’ve been on the lookout for old windows. 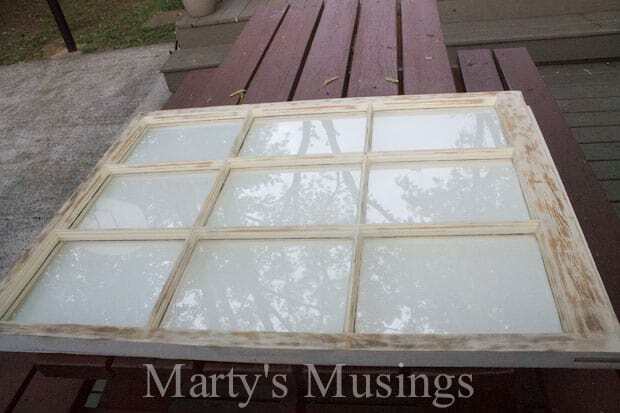 Check out my post on our bathroom window mirror! 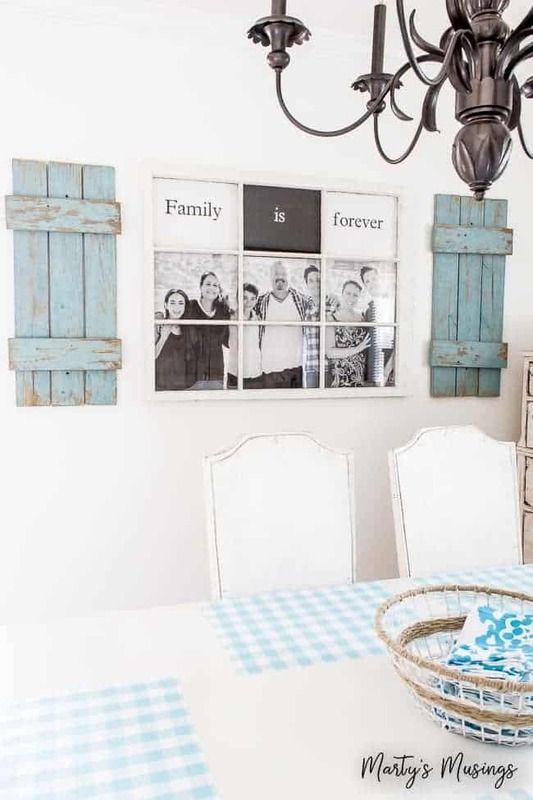 Just an FYI… the phrase Family is Forever is a mantra of the Mormon church. A couple has to perform the masonic rituals in their temple that binds them eternally and will make them gods of their own world one day. They believe this to be true of the god of our earth also, that he progressed to be god from once being human. 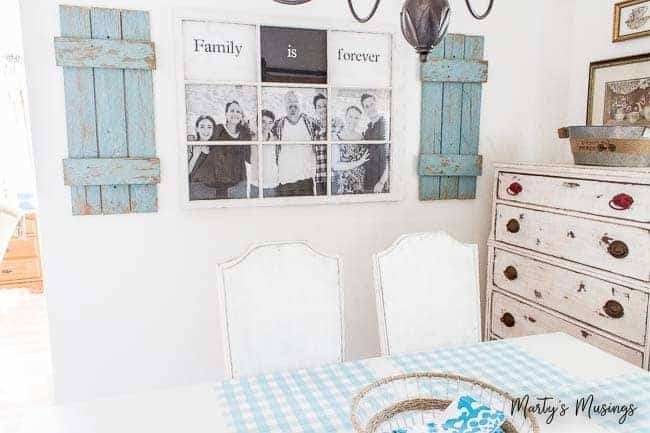 Do you really want that phrase hanging in your home? I left the LDS church 18 years ago and submitted to the true GOD of the Bible, eternally existent as God, my Savior, my LORD. Hi, Ashley. I appreciate you sharing the info with me. We use this phrase to emphasize to our children the bond of family that is made through both biology and choice. Our spiritual walk is an important part of our lives that we live out in other ways. Since that phrase has special meaning for us it won’t remind us of those Mormon beliefs that are not part of our beliefs. Thank you for sharing with me. Hi There! 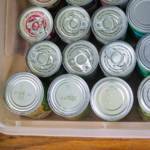 I love this project and am contemplating doing something similar. 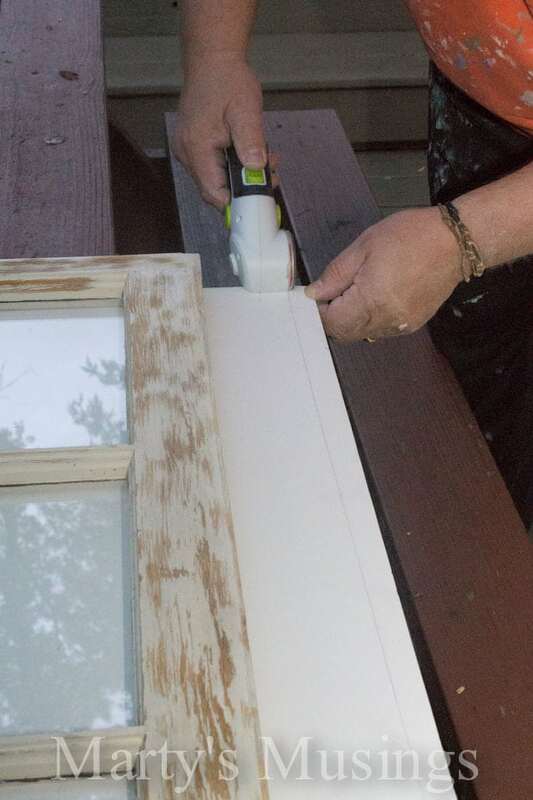 Quick question, how did you hang the window once it was complete? Thanks! From my husband: The window was hung on four 2″ L-brackets, two on the bottom and two on top in mirrored locations. I placed the window on the wall where we wanted it mounted and marked (with assistance) the bottom bracket locations, then removed the window. 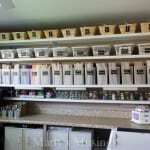 The bottom two brackets were screwed into the wall as you would typical use them – they look just like an “L”. The top two brackets were hung upside down to hide them. So, after the bottom brackets were installed, I placed the window on them and slipped the top two brackets behind the top of the window and marked where the TOP of the upside down bracket met the wall. The window was removed again and the top brackets were installed on the marks. 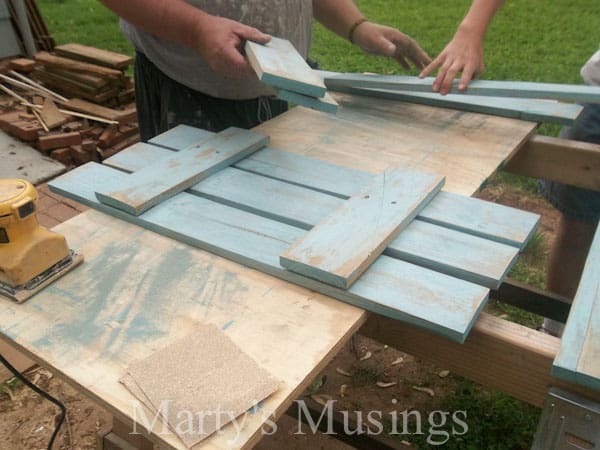 The window was then placed between all four brackets and screws were driven into the window at all four bracket holes – one screw on the window and two screws on the wall at each bracket. This way the brackets are virtually invisible since they are hidden behind the window! 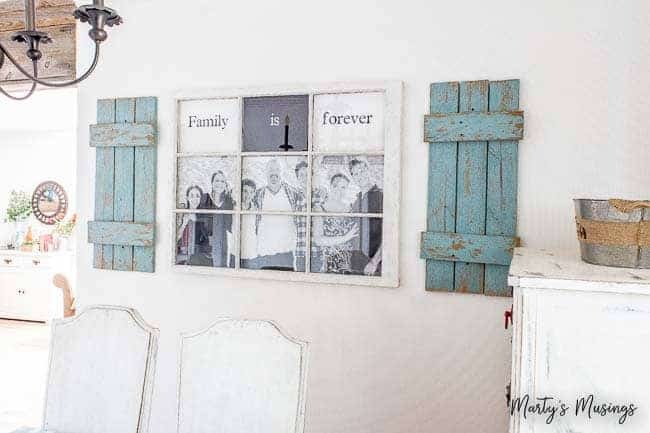 Did you cut the picture for each pane or did it just happen to fit that way? Hi, Linda. You can read the instructions for the tutorial and see that I sized the picture for the specific window I was using. Just check out the tutorial one more time! Good luck!